Last year I lost my hive mid-winter. I’m not sure if it was the cold weather or a disease. It wasn’t a lack of food because the bees left several full bars of capped honey. Bees cost about $100 for the initial hive and then it takes them time to build comb and to reproduce to their optimum size so you really don’t want to have to start over each year. This year I wanted to prevent repeating last year’s results. 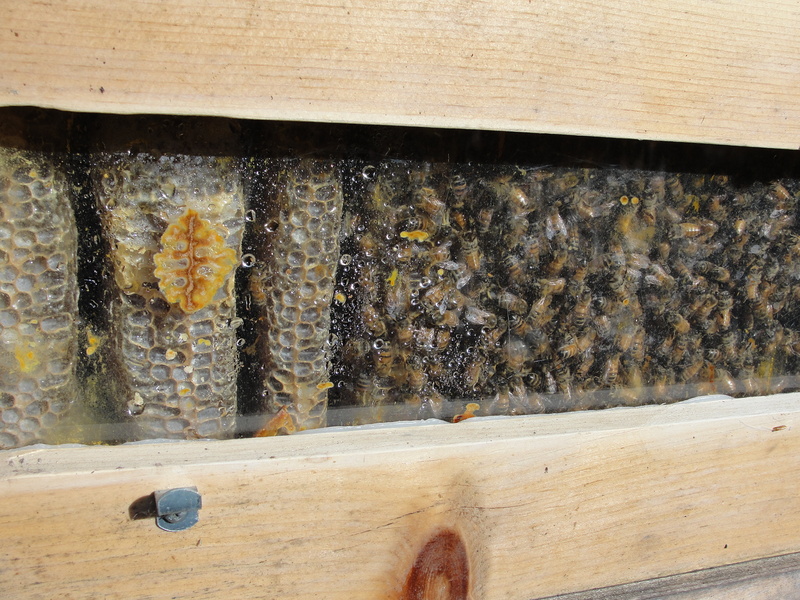 I put one hive of bees in my hive from last year that still had brood comb in it. This colony was able to get established much quicker than my brother’s hive where they didn’t have a foundation and had to build from scratch. During early winter there was no sign the bees were still alive. I couldn’t hear them, or even see them through the window on the hive. Thinking they were dead I opened the hive to harvest the honey before the moisture caused it to mold and ferment. To my surprise when I pulled the second honey comb and saw a group of bees looking back at me! I was excited to say the least but new I had to find a better spot for my hive. They weren’t getting nearly enough sun during the winter months to help keep them warm and the lack of heat was causing a buildup of moisture. 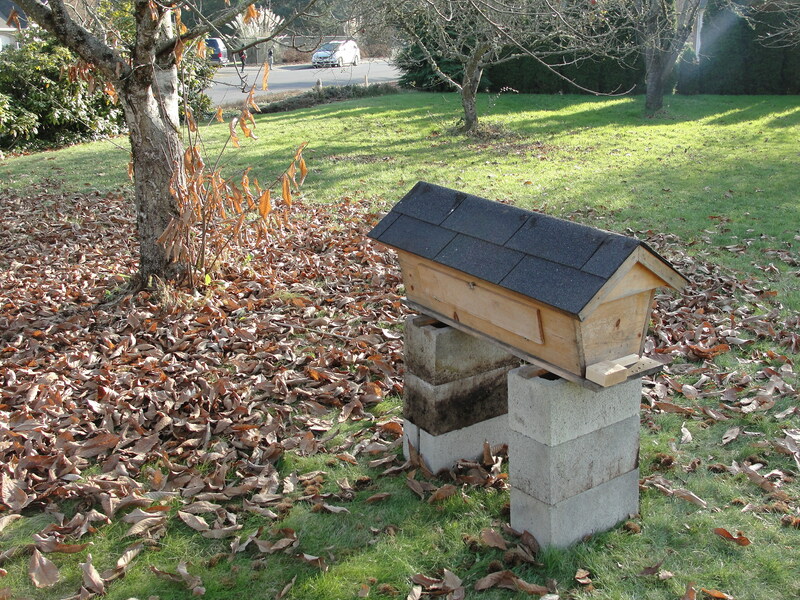 I moved the hive across the yard under a deciduous tree that would shade them from direct sun during the summer but that allowed for full sun during the winter after the leaves fell. 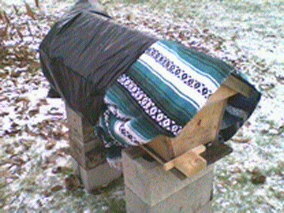 I then wrapped each of the hives with 2 Mexican blankets and pulled a large black garbage bag over each end. I secured the ensemble with bungee cords and then made a small slit in the one end to allow air flow and for the bees to be able to get out. I had to staple it to the wood on the front of the hive to keep it from blowing shut. 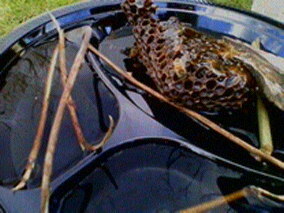 I placed some old comb with honey we weren’t able to salvage near the hive with some water during the days when the hive was showing lots of activity. The black plastic bags have been doing a great job attracting heat when the sun is out. We had some warm days a few weeks ago and the hive was extremely active. Unfortunately we just had a cold front for the last several days. I’m hoping they were able to make it through. If all goes well I intend to “split” the hive next year to create an additional colony. Today both hives showed proof of life. I’m hoping the weather will start warming up so they can get back to work.